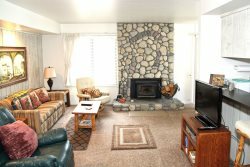 Nice Two Bedroom & 2 Bath Condominium in town near the Sierra Star Golf Course and the shuttle route to the Eagle Lodge Express Ski Lift Area in Mammoth Lakes. Sleeps up to 6. Ground Floor unit. The Master Bedroom has 1 Queen Bed and 1 Twin Bed and 1 TV. The second bedroom has 1 Queen Bed. Large flat screen TV in the living room and a New Queen Sofa Sleeper (July 2015). WIFI Internet Access in the unit. You enter the unit from the ground floor and it is all one level. There are 2 outside parking spaces available. There is a game room with a billiard table, a ping pong table and a video game in the lobby of the Sunshine Village condos. In the summer you have access to BBQ areas throughout the complex and a Tennis Court near the swimming pool at Sunshine Village. Coin-operated laundry facilities located in the common area near the office. COMPLIMENTARY INTERNET and CABLE TV are provided, however NO REFUNDS will be given for connectivity problems or Internet failure. TOT LICENSE 3390-SV165. The place is a good fit for our family of five. For its location, the value is great. Checkin and checkout are very easy. Thanks for hosting us, we had a great stay. The house is comfortable. We thoroughly enjoyed our stay at Sunshine Village, unit #165. I think the complex location in Mammoth is very convenient. The trash bins were easily located and easy to open & close. The staff was always very responsive. Email response was excellent too. We have been going to Mammoth for over 18 years for our annual fishing trip. This is our first stay at Sunshine Village. Thank you so much! Thanks, we had a great time. I will be calling again. The place was clean, cozy, and comfortable. Great location, close to the shops, and restaurants. The place was very comfortable and well equipped. It is well situated, walkable distance to restaurants and shops. The reservation process and checking was easy. Good place and location for the price. Thanks! This is a really nice spot to land in Mammoth. Fully stocked with cooking necessities, spices, etc. The sofa (Its a pull out bed) is really comfy to kick back on after a full day on the slopes and watch TV. Beds are comfortable. Heaters in every room. Turn your bedroom heater OFF while sleeping. We made the mistake of keeping it on and woke up in the middle of the night needing to cool down. Neighbors above were quiet. Easy walk to Vons market and the Pizza place. Easy walk to the Redline for shuttle service to the slopes. Guest services were great. We really appreciated our stay here. Thank you so much! Great location, easy check in, wonderful communication with the host. would stay again ! Thank you for all attention and we will definitely call you again.